Kyechok Tsulzang. Courtesy of Orgyen Tobgyal Rinpoche. Lama Norlha or Guru's Wealth Deity (Tib. བླ་མ་ནོར་ལྷ་, Wyl. bla ma nor lha) is a wealth practice from the Chokling Tersar, related to the Tukdrup Barché Künsel cycle. 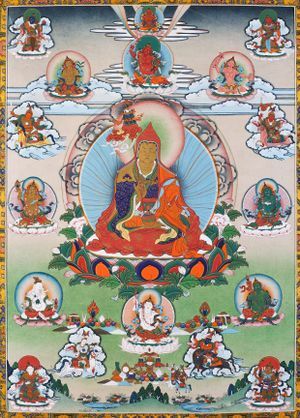 The main deity is Kyechok Tsulzang, one of the Twelve emanations of Guru Rinpoche. This page was last edited on 27 March 2018, at 13:32.